3 double bedrooms, 1 en-suite shower room, 1 separate shower room, kitchen, large lounge & dining area, large balcony overlooking the pools & sea front. Internal facilities include: air conditioning/air blown heating, washing machine/tumble dryer, 2 Smart tvs to lounge & master bedroom, fully fitted kitchen, free wifi. External facilities 3 infinity pools, 1 of which is heated, child pools & play areas, gym, sauna & steam rooms, jacuzzi & cold plunge pools, paddle court (4 no. rackets available). Beautiful clean sandy beaches, fantastic promenades & sea front walks. Nearby shopping centres, restaurants & bank atm 10 minute walk. Murcia airport 30 km/25 minutes or Alicante airport 45km/45 minutes. On arrival at the apartment you will be met by someone to handover keys and apartment information to enable you to make the best of your stay. Hello we are the owners, Karen & David, and we have been coming to visit our family in Torrevieja for over twenty years. On seeing the beautiful apartments at Sea Senses and the stunning location we fell in love with every aspect of the development. The sunrise and sunset and everything in between these times are captivating. We hope that family and guests will be able to enjoy the beautiful location and surroundings as we do. 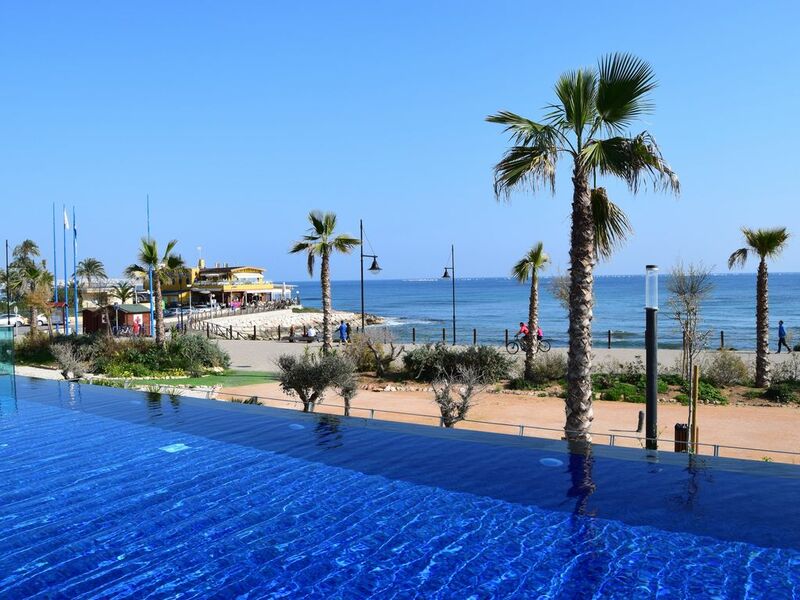 The sea views are breathtaking and the colours on the horizon change throughout the day, there is always something to do, long walks along the sea front, swimming in the sea or pools, plenty of safe areas for children young and old to play. If you feel more active you can work out in the gym, play paddle tennis or go on lovely runs along the coastal paths, or perhaps just relax and soak up the sunshine. There are lovely sandy bay beaches close by to enjoy with eating and drinking facilities close at hand. Fantastic location with superb facilities for relaxing or getting fit, whichever is your preference. The complex has excellent security provisions, is fully gated and enclosed with extensive planted garden areas and hard landscaped areas. 2 bathrooms, 1 En-suite bathroom with shower, and vanity unit, with a separate shower room with vanity unit, all fully tiled. 3 pools at the complex, one of which is heated, plus children's pool. Water sports, golf courses, cycle hire is all available nearby. Torrevieja main town and marina is approximately 3km distance. Beach side walks, bus routes closeby. Thank you Sarah and Lee we were very pleased to receive your late booking request and to be able to accommodate you, and were very happy to hear that you enjoyed your stay at Sea Senses. Thank you for choosing us on this occasion and we hope to see you again next summer all being well. Thank you for your message we were very happy to hear that you and the family felt at home and enjoyed your stay at the Sea Senses complex, it always feels so relaxing when you are there, it is just a shame that the time cannot slow down as well when you are there. Thank you for being our first guests from Iceland as well. Just returned from a short break staying at Sea Senses Punta Prima. The apartment was excellent for our family of 4, spotless clean and very well equipped. The sea view from the balcony was stunning. Would definitely recommend your apartment to others. The complex itself is beautiful and very well maintained the only downside was that all the pools were very cold (even the heated one) but this didnt really deter the kids from going in, I’m sure in the summer months this wouldn’t be a problem. Thank you for your message and we were delighted to hear back from you and that you and the family enjoyed your visit to Sea Senses. Sorry to hear that the pools were a bit chilly, I will review the heated pool myself on my next visit in mid November as normally this pool and the nearby jacuzzis are warm enough to use all year round, it is just the cold air that normally gets you when getting out from the end of October through to mid April time. Though the sauna and steam rooms in the nearby gym pod offer the perfect place to reheat. Thanks for choosing us for your holiday on this occasion. The property is amazing couldn't fault a thing. Stayed here for a week in sept for my daughters wedding....all I can say it was amazing...the views were spectacular ....the apartment was everything we expected and more!! I would have rated it a 5 star as I assumed there would be beach towels available but there wasn't any. Apart from this one word MAGNIFICENT!!! Glad to hear that your daughters wedding went well and that you enjoyed your stay. We were sorry to hear that the beach towels were lacking, I will find out what happened there as we recently bought a new supply of towels which should have been at your disposal for your stay so we would apologise for any inconvenience this may have caused you. Please note that we are always contactable to sort out any such issues via telephone or e-mail as they arise, which we could have tended to in this case given the opportunity, but nonetheless we apologise for the issue encountered. Thank you so much David the property was exceptional, modern and ticked all the box’s. My family had a great time and the whole complex was very well kept the staff were always cleaning. It was not busy and we always managed to get sun beds no matter what time of day. The pools were excellent, and the play grounds for the children kept my grandson entertained. The Nautilus restaurant, a stones throw away provided a varied menu, great prices and very tasty food. I would definitely recommend this property to anyone. Thank you for taking the time to provide a review of your visit and we are very pleased that you and the family had an enjoyable holiday, it is a great month to visit the apartment as it is still very warm and yet not too busy so you are able to make the most of everything. Thank you for choosing us for your holiday on this occasion. The apartment and complex are outstanding! The view from the kitchen/diner and balcony was amazing! The apartment itself was immaculate and a real home from home - it had everything we needed. The pools are fantastic, nice and warm so you can relax in them without getting cold, and kept the kids entertained. It was great to be able to go to the beach which was only seconds away to go snorkelling. This beach was rocky so may not suit everyone, but Punta Prima beach which is 8 mins walk away is great for bathing, swimming and body boarding. We enjoyed the local restaurants (especially Nautilus) but headed into Torrevieja for a wider range or restaurants and for more things to do in the evening (shop, fun fare, etc). There are 2 mini-markets about 5 mins walk away where you can get your basic provisions, and the Consum is about 15 mins walk and has everything. We would highly recommend this property for a quiet, relaxing holiday. Thank you for choosing to take your holiday with us this year and we are delighted to hear that you all enjoyed your visit and had a relaxing time. 6nr coloured wrist bands will be issued in the summer for use to determine residency, one available for each guest, if these are not returned on departure a fee of £10.00 will be charged & deducted from the deposit for each wrist band not returned.